Introduction to Statistical Investigations leads students to learn about the process of conducting statistical investigations from data collection, to exploring data, to statistical inference, to drawing appropriate conclusions. 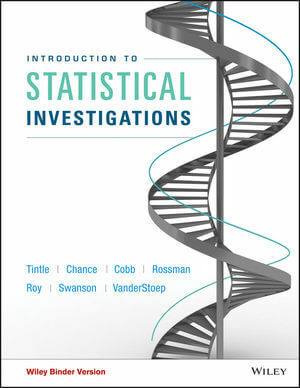 The text is designed for a one-semester introductory statistics course. It focuses on genuine research studies, active learning, and effective use of technology. Simulations and randomization tests introduce statistical inference, yielding a strong conceptual foundation that bridges students to theory-based inference approaches. Repetition allows students to see the logic and scope of inference. This implementation follows the GAISE recommendations endorsed by the American Statistical Association. 1.0 Significance: How Strong Is the Evidence? 1.4 What Impacts Strength of Evidence? 2.0 Generalization: How Broadly Do the Results Apply? 3.0 Estimation: How Large is the Effect? Spiral approach to statistical process. A six-step process for conducting statistical investigations introduces students to the fundamental concept of statistical significance, along with collecting data and drawing conclusions. Active learning approach. Explorations in each chapter incorporate a variety of learning experiences such as shuffling cards, flipping coins, collecting data, running experiments, and using simulations. Explorations are flexible for individual student’s use or small to large groups, in and outside class. Randomization-based introduction to statistical inference. Makes use of modern computing and puts the logic of statistical inference at the center of the curriculum. Real data from genuine studies. Uses real data from genuine research studies throughout the book, taken from a variety of fields of application. Focus on logic and scope of inference. Students are asked to consider questions of logic and scope of inference for every study encountered in the text. WileyPLUS is a research-based online environment for effective teaching and learning. WileyPLUS is packed with interactive study tools and resources—including the complete online textbook—to give students more value for their money. WileyPLUS is equipped with an adaptive learning module called ORION. Based on cognitive science, WileyPLUS with ORION, provides students with a personal, adaptive learning experience so they can build their proficiency on topics and use their study time more effectively. WileyPLUS with ORION helps students learn by learning about them.